Let me start off by clarifying the title of this post. I don’t mean Designer vs. Developer in the “grrrrrr… let’s fight” sort of way. I simply want to show the difference between the two, because there is one. 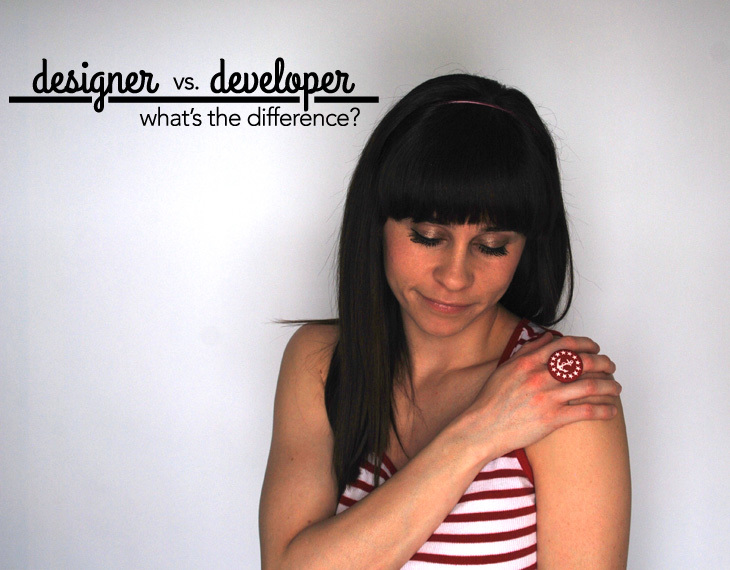 Designers and Developers don’t think the same way and they often don’t like to be confused for the other. Each has their own skill set and, although they work together, they are not the same. So, if you’re getting a website built from a larger studio, chances are that you have both a designer and developer working on it. Designers are more on the creative art side of things. They meet with the client and put together the graphics to make sure that it looks great! Designers also pay close attention to the usability of the site. Who will be using it and why. So, if you were to get a site built for your business, you would work with the designer to make sure that the layout is consistent with your brand. Developers work on the other end – the back-end. They program the site so that it functions properly. They pay close attention to the coding, script, and overall functionality. You most likely wouldn’t work closely with a developer, unless you were designing it on your own. Usually the Designer will relay what needs to be done to the developer. So, although designers and developers are different, they both work together to achieve the same goal: a successful website!